Famous for helping to start the Mexican Mural Movement and spread the socially engaged style around the world, Diego Rivera and his wife Frida Kahlo are Mexico's most renowned artists. The city of San Francisco actually hosts three of Rivera's most important works, each located within a different historic city institution, as well as many other murals that were inspired by him including the murals inside of Coit Tower and the many street murals of the Mission District. All Diego Rivera murals are open to the general public free of charge. Painted in 1940 for the Golden Gate International Exposition this gigantic piece (22 feet high by 74 feet long) is a monument to the unity of North and South America and was one of the centerpieces of the Expo. The fresco dominates the lobby of the theater building at City College of San Francisco, which is easy to reach from Union Square on the BART or Muni Metro. This mural is considered one of the most important works of art in the Bay Area as it portrays an extensive exploration of the history, art, and culture of the Americas, including both indigenous and European perspectives. This six section fresco occupies the entire wall of its own gallery within the San Francisco Art Institute, one of the country's oldest and well-respected art schools. The mural depicts the painting of a fresco within a fresco, which in turn portrays the construction of San Francisco itself. This major work of Diego's is located right between North Beach and Fisherman's Wharf, in walking distance from either, and is easy to add to a day of sightseeing activity. 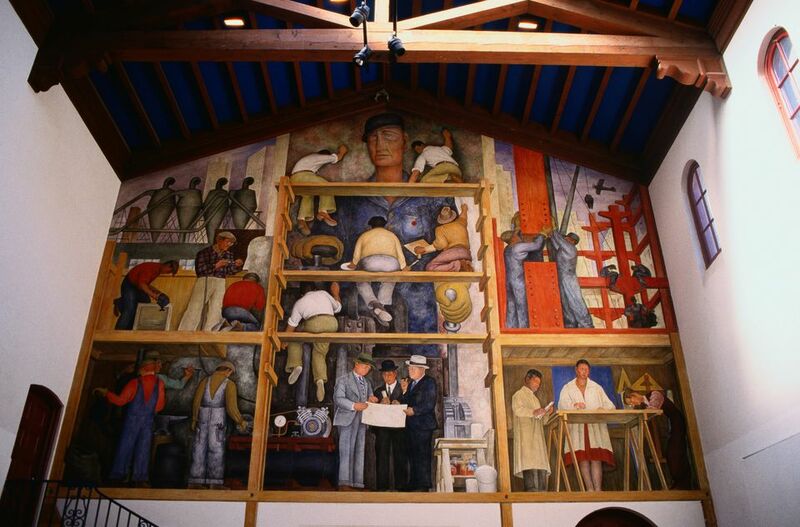 The "Making of a Fresco" mural was painted in the school itself by Rivera in 1931. Featuring "Califa", the sacred spirit of California itself, Diego Rivera's "Allegory of California" graces the wall and ceiling of the grand stairway inside this historic stock-trading building in the heart of the financial district. Within easy walking distance from Union Square and all points downtown, the mural was controversial when Rivera painted it in 1931, as his decidedly left-leaning politics were not well received by the capitalist traders of the day. The fresco depicts a variety of early California industries, including gold mining and oil drilling. Although not done by Diego Rivera himself, the murals that decorate the inside of Coit Tower on Telegraph Hill were completed in the 1940s by a group of muralists that considered Diego Rivera to be their mentor. Located in the lobby and the staircase the murals are strongly socialist in context and depict the struggle of workers worldwide against corrupt authority. Look for the newspaper in the "Library" mural which features a headline story about the destruction of Rivera's mural "Man at the Crossroads" fresco in New York City. The mural was destroyed because it featured Lenin.